PARIS — A startling exhibition in Paris, drawn from the Arab world’s biggest private art collection, shows the dizzying mix of cultures in the Gulf in the past with Chinese korans and Persian rugs of the Virgin Mary. The show at the Paris headquarters of UNESCO, the world cultural and scientific body, is taken from the vast treasury of artworks amassed by Qatari billionaire Sheikh Faisal Bin Qassim Al Thani. The Majlis - Cultures in Dialogue takes the name of the traditional spaces where guests were sat down and entertained in the Gulf to show how ideas were exchanged in the region, often in unexpected ways. It shows how Islamic, Jewish, Indian, Christian, Buddhist and African imagery and symbolism was mixed and shared in an enormous number of objects and manuscripts over centuries. For the sheikh, a distant cousin of Qatar’s emir, it proves that "the great religions are united by shared moral honesty and authenticity". It was a "lack of culture" that leads fanatics to destroy historic sides in Mali, Syria or Afghanistan, he said. "We think that globalisation is new, but these works show the links between empires," said his daughter, Sheikha Alanoud bint Hamad Al Thani, pointing to a rug showing Germany’s Kaiser Wilhlem II and his family surrounded by the heads of Persian rulers. Another curious Persian rug from the first half of the 19th century shows "51 of the most eminent figures of the universe" including Confucius, Moses, Socrates, Jesus, Alexander the Great, Christopher Columbus and Napoleon. 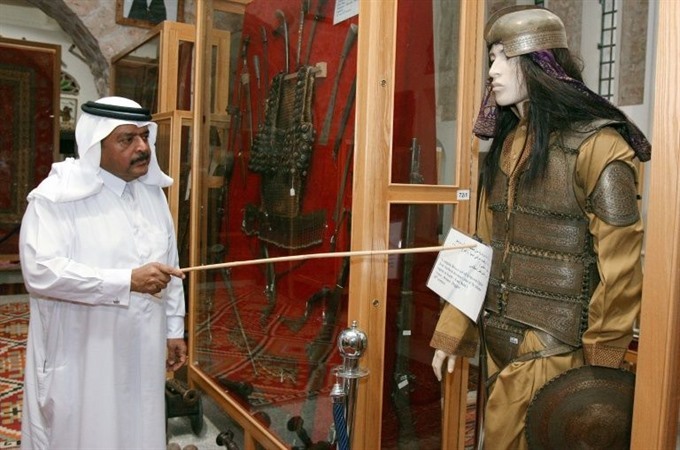 The show, which will go on tour to the US, Britain, Austria, Germany, Turkey and China after closing in Paris in March, is drawn from the sheikh’s museum in Qatar.